You have to put it [halibut hook] down and you have the weights on it, big weights. 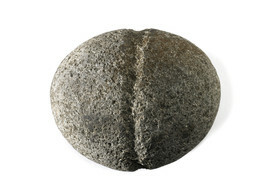 Stone fishing sinkers were made from beach cobbles. A line groove was pecked around the sinker by hitting it with a hard, pointed rock.